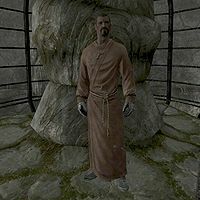 Florentius Baenius is an Imperial priest added by the Dawnguard add-on, whom you recruit into the Dawnguard. He is a master trainer in Restoration, and will sell you a wide variety of Alchemy-related items. He also sells the spells Stendarr's Aura and Vampire's Bane. Florentius believes himself to be a direct channel of Arkay which leads to some interesting and humorous dialogue. This is a frequent topic of conversation for Dawnguard members Gunmar and Sorine Jurard. It is also the source of some previous friction in his relationship with the Dawnguard leader, Isran. Initially, Florentius wears monk robes, a pair of steel plate boots, a pair of steel plate gauntlets, and an amulet of Stendarr. Later, he dons a set of Dawnguard equipment, including gray Dawnguard heavy armor with Dawnguard boots and Dawnguard gauntlets. He is equipped with a leveled one-handed weapon, carries random leveled bandit loot, and has a 25% chance of carrying an additional 1-9 gold. After you join the Dawnguard and learn that you can find the Moth Priest at Forebears' Holdout during Prophet, Sorine Jurard will request that you speak with Isran about recruiting Florentius. Isran will eventually agree, and inform you that Florentius can be found in Ruunvald, beginning the quest Bolstering the Ranks. You must travel there and fight your way through many charmed vigilants and the warlock Minorne to save Florentius. Upon speaking to him, he will express: "I knew it! I knew Arkay would save me. I asked for help, and he sent you! You are a very welcome addition to this dreary place, my friend. I owe both you and Arkay a great deal. I'm sure I'll manage to repay him later, but you... What can I do to thank you?" If you tell him to meet you back at Fort Dawnguard, he will respond: "I suppose I could... what, praytell, is there?" Telling him that Isran needs his help will result in him answering: "Isran? My help? Is this... some kind of a joke? Did Arkay put you up to this? Isran's done nothing but mock me. He's never given me the respect I deserve." Either of these dialogue choices will lead to you telling him you need his help, and he will say: "Look, I've just gotten myself out of quite a mess here, in case you haven't noticed, and while I appreciate your help, I... What's that? No, that's not what I... Yes, but... Are you sure? Really? Fine. Arkay says it's a good idea for me to go. I don't agree, but he's not the sort of fellow you can just ignore. I'll see you at Fort Dawnguard, then. Don't worry, Arkay will show me the way." He will then move to Fort Dawnguard, where he remains from then on. 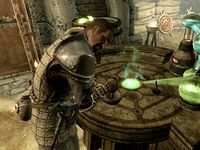 After he is back at Fort Dawnguard, if you ask him what he has for sale, Florentius may say: "Potions my friend, potions! Possibly some spells. Maybe some other things I've forgotten about. Actually I'm not sure. Let's see, shall we?" or "Oh, well... some... things, I suppose. Remedies, cures, a poison or two." or "Look, I'll be honest with you. I have no idea. But I'm sure we can find something worth your time." When spoken to, he may greet you by saying: "Arkay's been watching over me for years now. He says he's not too sure about you yet, though. ", "I once killed thirty vampires with my bare hands, you know. Ask Arkay, he'll tell you. ", "Don't you worry about me. I've been through worse. I'll come out of this just fine. ", "It is my sworn duty to see Arkay's wrath delivered to all the undead. It's usually a good bit of fun, too. ", "Arkay be with you, my friend." or "What can I do for you?" He will exit conversations with: "Arkay bless you, friend. ", "We'll speak again soon. ", or "Farewell." If your skill in Restoration is less than 90, asking Florentius for Restoration training will result in the response: "A noble cause. Arkay likes the idea very much, so I'm happy to help." If your skill in Restoration is at 90 or above, he will instead say: "You know more than I do now. Arkay has us both beaten, but he's not giving up all his secrets." In combat, Florentius may use taunts such as: "Arkay and I will stand triumphant! ", "You can't beat us!" or "You'll be meeting my friend Arkay very, very soon!" This is the merchandise found in Florentius' merchant chest. These items are only available if purchased from the merchant; they cannot be pickpocketed or stolen. They are restocked every two days. When encountered during Destroy the Dawnguard, he will still be wearing his priest robes. ? This page was last modified on 4 September 2018, at 00:03.